We all are aware of Net Neutrality and the recent controversies over it in India. Net Neutrality is simply the Internet Freedom — Free, Fast and Open Internet for all. India has been battling for Net Neutrality since zero-rating services such as Facebook’s Internet.org and Airtel Zero were announced. 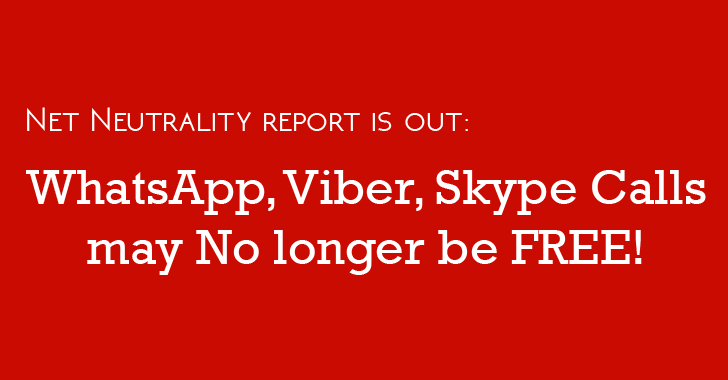 The Department of Telecommunications (DoT) has now released a much-awaited report [PDF] on the Net Neutrality issue, recommending the Telecom Regulatory Authority of India (TRAI) to regulate the voice calls conducted by the Internet users of over-the-top (OTT) services. Over 100 pages-long report details the DoT's understanding of Net Neutrality Principles, which has been criticized by consumer groups because it could End Free domestic voice calls offered by apps like WhatsApp and Skype. The Report says, "the core principles of net neutrality must be adhered to," and user rights on the Internet need to be protected, so that the Telecom Service Providers (TSP) do not able to restrict their ability to access any service on the Internet. The report recommends TRAI to consider the demands of telecom service providers to regulate domestic VoIP calling services, while taking a liberal approach to international VoIP services. This indicates that if you call your someone living abroad using Skype, Viber, WhatsApp or any other VoIP service, then you are not charged if you have a running Internet pack. However, if you want to make VoIP call using WhatsApp, Viber or Skype within India, the telecom providers would charge you. Criticizing Facebook’s Internet.org, the report says "the content and application providers cannot be permitted to act as gatekeepers" and go against the Net Neutrality principles. "Internet.org acts as a gateway, as opposed to a gatekeeper, to Internet access by breaking down the cost, infrastructure and social barriers that exist today. We welcome the DoT's engagement and consultation process and are committed to working with all stakeholders to overcome the infrastructure, affordability and social barriers that exist today and to bring more people in India online." Zero-rating is the practice of service providers not charging end users for data used by specific apps or websites through the network, in limited or given data plans. DoT has rejected the demand for regulation of over-the-top (OTT) Free messaging services, including WhatsApp, Viber and Hike. So, you can enjoy chatting with your friends and relatives over WhatsApp, Viber and Hike for Free. Though the committee's report is not the final view of the government towards Net Neutrality, the report has only been presented to TRAI, which will consider its ideas and form its own recommendations for the government’s final call on new legislation.